Contrast-enhanced computed tomography of the abdomen in coronal view showing peripancreatic inflammatory changes consistent with acute pancreatitis. The diagnosis of acute pancreatitis requires 2 of the following 3 features: 1) abdominal pain consistent with acute pancreatitis; 2) serum lipase activity (or amylase activity) at least 3 times greater than the upper limit of normal; and 3) characteristic imaging findings of acute pancreatitis.1 Although normal serum amylase levels have been reported in some cases of acute pancreatitis,2 acute pancreatitis with normal serum lipase has been rarely described in the literature due to its negative predictive value of between 94% and 100%.3 Moreover, other pancreatic enzymes have not been mentioned in the previous reports of acute pancreatitis with normal serum lipase or amylase. Herein, we present a case of acute pancreatitis with normal serum amylase, lipase, trypsin, elastase-1, and phospholipase A2. 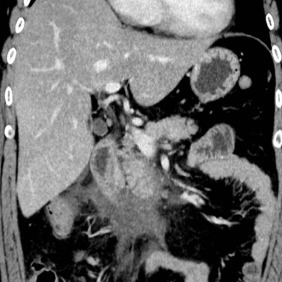 A 42-year-old man presented with severe abdominal pain of 48 hours’ duration. He had no history of alcohol use and pancreatitis. His laboratory tests showed leukocytosis (13.1 × 109/L) and very severe hypertriglyceridemia (2275 mg/dL). C-reactive protein was elevated at 34.06 mg/dL (reference range, < 0.3 mg/dL). His serum amylase and lipase levels were 12 U/L (reference range 43-116 U/L) and 41 U/L (reference range 5-50 U/L), respectively. Contrast-enhanced computed tomography showed significant peripancreatic infiltration around the pancreatic head with fluid accumulation compatible with the diagnosis of acute pancreatitis (Figure). On admission, other serum pancreatic enzymes were evaluated to strengthen the diagnosis of acute pancreatitis. However, none of the serum enzymes were elevated: trypsin 160 ng/mL (reference range 100-550 ng/mL), elastase-1 80 ng/dL (reference range < 300 ng/dL), and phospholipase A2 173 ng/dL (130-400 ng/dL). Based on his clinical, laboratory, and imaging findings, there was no evidence of biliary pancreatitis or chronic pancreatitis. The patient was diagnosed with hypertriglyceridemia-induced acute pancreatitis and treated with bowel rest with intravenous hydration and pain control. His symptoms continued to improve without complication, and serum levels of pancreatic enzymes remained normal throughout the hospitalization. The patient was discharged home on day 17 with medication of bezafibrate. Previous reports have suggested that extensive pancreatic necrosis, late presentation of the patient, and very early pancreatitis could be causes of normal serum amylase or lipase levels.3, 4, 5, 6 However, based on his clinical and imaging findings, our case did not fall under any of the above. To the best of our knowledge, this is the first report describing acute pancreatitis with normal trypsin, elastase-1, and phospholipase A2. Although further investigation is needed to fully understand the underlying mechanism, we stress the possibility of acute pancreatitis with normal serum pancreatic enzymes on the basis of our atypical findings.